The Rev. Angelo F. Rinella, CSV, Age 93, died at Holy Family Hospital, Des Plaines, IL, on June 21, 1983. He was a member of the Clerics of St. Viator for 74 years and a Priest for 65 years. He was born in Termini-Imerese, Italy, in 1890, the son of Cosmo and Josepha Rinella. He entered the Clerics of St. Viator in 1907 and was ordained to the priesthood in 1918. For many years he was a member of the Viatorian Mission Band preaching retreats and missions. 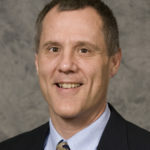 He also taught at St. Viator Academy in Bourbonnais, IL and Columbus College in Chamberlain, SD. He was Pastor of St. Patrick’s Church, Kankakee, IL, from 1944 – 1950. 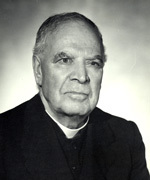 From 1950 – 1982 he assisted at St. Bartholomew and St. Viator Churches in Chicago. At the time of his death he was the oldest Viatorian in the world, and resided at the Clerics of St. Viator Province Center, Arlington Heights, Illinois. Visitation was held at St. Bartholomew Church, Lavergne and Addison, Chicago, Friday, June 24, 1983. Mass of Resurrection was held on Saturday, June 25, 1983 at St. Bartholomew Church at 11:00 A.M. Interment Queen of Heaven Cemetery, Hillside, IL. The Very Reverend Kenneth R. Morris, CSV, Provincial, was the principal Celebrant and the Reverend James F. Crilly, CSV, former Assistant Provincial, was the Homilist. The Very Reverend Thaddeus Jakubowski, Urban Vicar, represented the Cardinal.